It’s been three days since I started building my kingdom. The monsters have been increasing in numbers each night. Our walls still stand, but we lost an archer in the fray. I’ve ventured further into the woods than normal to convert some lowly vagabonds into new recruits. I’ll need to purchase some new bows for them of course, but that shouldn’t be a problem, so long as they pay their taxes. Through a clearing in the forest, I spy a massive stone tablet covered in runic symbols. A prompt to give it the majority of my wealth appears. I have no idea what giving it money will do. It’s just a shiny, massive, very curious stone. I feel the uncanny desire to splurge. 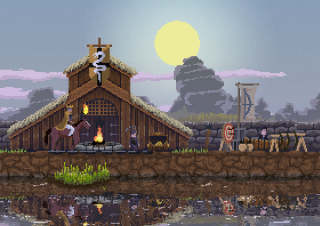 Kingdom is a sidescrolling exploration and base management game—a collaboration between two developers: Licorice from Iceland and Noio from the Netherlands. You play as an entrepreneurial king or queen. Venture out on your horse, hire some folks, and start building. But choose your purchases carefully. It's simpler to play than it sounds. You move left or right, combing the forest for new recruits, uncovering ancient secrets, and looking for new ways to expand your territory and technologies. It all operates on a deep economy. Besides walking left and right, every interaction involves the exchange of coin. Early on, the most essential resources boil down to followers, equipment, and walls. Followers can be recruited with a single coin, which you can toss by pressing down on the keyboard. Some will wander your way automatically, some are camping deep within the forest. You can assign every follower a job by purchasing them a hammer or a bow in your village. As you progress, it’s possible to develop new jobs. How many total? No clue. Hammers convert followers into builders, which then carry out build purchases, like walls and fort upgrades, both of which slow enemy assaults. Bows convert them into archers. They hunt rabbits during the day (dead bunnies yield one coin each) and defend your base from monsters at night. My archers have terrible aim and are the worst, but I still love them. They’re too loyal not to. When night comes (and the sun sets quickly) monsters emerge from the forest and attack your kingdom start-up. The catch is, they won’t kill you or your followers, they’ll just destroy your walls and try to drain you of your wealth, a game over when it’s all gone. Monsters knock over your followers and steal their coins, but only get a chance if you fail to properly prepare. I should’ve invested more in that wall! Just one more archer and I might’ve made it! Why did I drop six coins on that dumb rune? And so on. Learning how and when to spend is vital. There are optimal investment paths, but none of the most helpful mechanics are overtly communicated, and with a high difficulty curve, it’s important to pay attention and uncover every hidden system and advantage possible. Kingdom is the type of game that inspires big FAQs and dedicated subreddits. The pixel art is inherently lo-fi, but surprisingly expressive. Paying attention to subtle cues in visual information can make the difference between a high castle and a barren patch of broken dreams. The same goes for the lovely score. Composed by Amos Roddy (a.k.a. ToyTree) of Portland, the tunes and sound evoke a somber sense of age and mystery, but also function as subtle mechanical cues, vital for understanding the game’s systems. How Kingdom’s chain of discovery plays out will likely determine how it fares. The developers plan to support the game after launch and the players’ reactions will determine what form that support takes. Players will have to crack the many mysteries in the initial release first, the depth of which remains to be explored. Nothing obvious happens when I give the giant runic tablet my money. Big monsters destroy my village in the night because I can’t afford any more bows, and I get a game over. I’ve been assured my frivolous rune spending wasn’t a waste—I’m told it has a vital effect, but maybe wasn’t worth every last penny while in dire need of defenses. Kingdom channels the same financial anxiety I get after a bad month of budgeting or checking on my college debt. Only I get a do-over in Kingdom. It’s not easy, but there’s some logic buried beneath its oblique presentation, some hope to get it right. The build I played was limited and early, but for now, it seems that Kingdom is on track to be a cryptic, gorgeous, and righteously frustrating way to spend time. It releases ‘when it’s done,’ likely this fall.